When my friend Stephany asked me to modify a current card I had with her... I loved the idea! 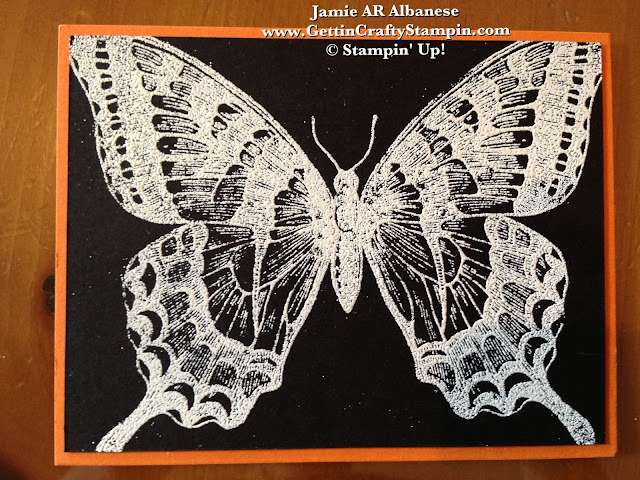 Here is a fun project we created and change for my Stampin' Up! Convention. It sure is a great way to brighten the day of a friend! Please let us know what you think with a comment!! With a Pumpkin Pie card stock base (#105117), Basic Black card stock (#121045) primes this card for a fun look. 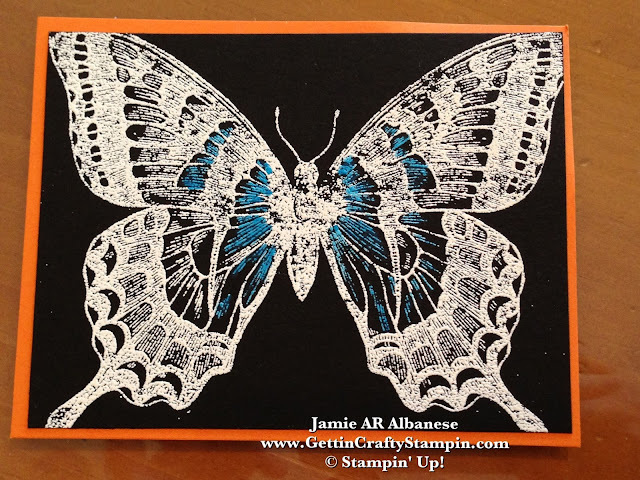 Heat emboss the Swallowtail (#129216) background stamp. Prep the card stock with our Embossing Buddy (#103083) and stamp, with our Versa Mark pad (#102283) this image. White embossing powder (#109132) creates a fun chalkboard image look. Our Heat Tool (#129053) is so quiet and easy to use! I toted these beauties to Utah and my beloved nieces, Claire and Meagan, jumped in to help me finish my swaps for convention! Family time rocks!! This clean image is very pretty. CLICK HERE to see my original card, inspired by Vera Bradley. Permanent Markers in this bright turquoise really POPS on this background! Adding a fun bright orange to tie in the paper and remind me of one of my favorite butterflies, the Monarch. I can't wait for convention! Thousands and thousands of women and some men will fill the Salt Lake City Convention Center as Stampin' Up! Celebrates their 25th Anniversary! Join me as I will be posting pictures and more on my blog! CLICK HERE to see my upcoming classes! 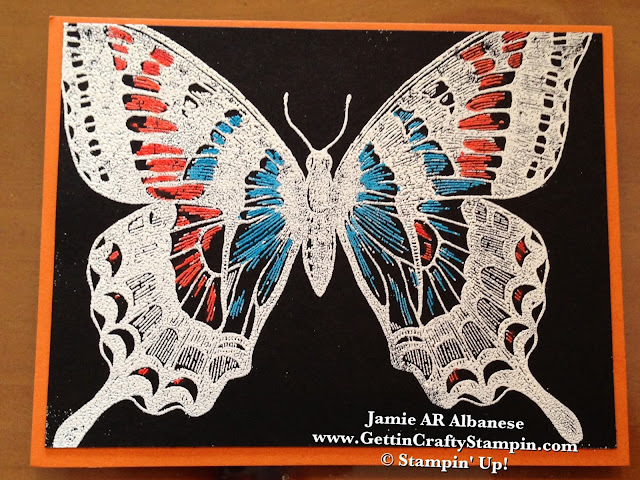 The 26th will be my Bringing Back Convention class... see what is new and have fun creating unique cards! I look forward to seeing you back here and soon! Leave me a comment and let me know what you think. Please Pin this, Share this, Email, Facebook, Tweet, Google+ and more!